Fenton produced this pattern abundantly in several different sizes and shapes. It certainly was a counterpart to the Northwood Grape and Cable pattern. Apparently Vintage was easily as acceptable to the buyers market, for many beautiful examples remain today. Some examples appear to have been coveted over the years for their beauty alone, and never used nor abused. 9” Plates in Fenton Vintage are rare. Amethyst/purple, blue, green and marigold are known color . All plates have the Wide Panel exterior with a plain marie. 1. A different interior plunger was used for 9” and 10” Fenton Vintage bowls, along with at least two different base moulds. 2. Dugan/Diamond Vintage Variant is not the same as the design on Fenton pieces. The reason for calling it a Variant is not clear. This is simply a different overall design from that used on Fenton pieces. 3. No Dugan Vintage has a Wide Panel exterior. 4. No Fenton Vintage has a dome foot. This is the defining difference in product from each manufacturer. 5. Whether or not there is a break in the vine does not define the differences between the pattern used by either of those manufacturers. 6. Edge treatments are different, as well. A more saw-tooth type edge is found on Fenton examples. Dugan/Diamond examples are more smooth in appearance. 9 in. 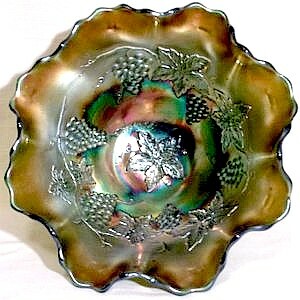 Fenton VINTAGE Bowl quite similar to the one found on Dugan dome footed bowls. Exterior of the 9 in. 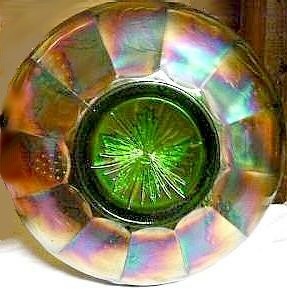 Green Fenton VINTAGE Bowl with an unusual star within the marie. 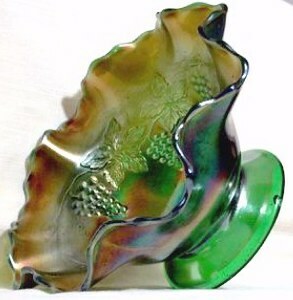 9” Green ice cream shape Bowl: displays the 6 grape clusters and seven leaves with a separation or gap in the flow of the vine. 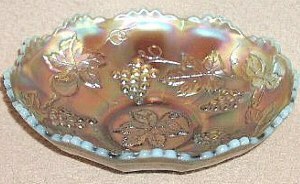 As you look at the exterior of this same bowl, the Wide Panel design is enhanced with a ring of scallops at the edge of the collar base, along with a star inside the marie, or base, indicating that a different mold was used, perhaps resulting in a request from a buyer for other than the customary paneling and plain interior marie? 10 in. Fenton VINTAGE in Red - notice the break in the vine! The same plunger was used on both the green and this red bowl. 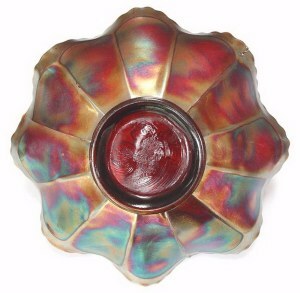 10” Red ruffled Bowl: indicates use of the same interior plunger as that used on the green 9” bowl. However, this bowl has the Wide Panel exterior and plain marie. There are 6 grape clusters and seven leaves. 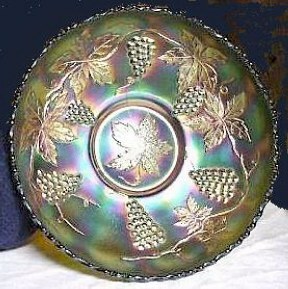 9” Green ruffled (dome footed) Bowl: While there are 6 grape clusters and seven leaves, along with a gap in the vine placement, the dome foot defines the manufacturer. 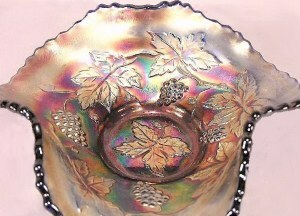 There are no known collar based bowls made by Dugan/Diamond in the Vintage pattern. Often called Dugan's Vintage Variant, research indicates that since celeste blue is found in this dome footed bowl, with that color introduced in 1916-1917, following the departure of Thomas Dugan, Diamond production was likely brief. Few examples in any color are available, with the plates considered rare. Amethyst and marigold are the only known colors in these approx. 9 ½” footed plates. They have a smooth exterior. With exception of one known bowl in purple, having the Compass exterior, the others are smooth with no design. Ruffled bowls can be found in amethyst, cobalt blue, celeste blue, green, marigold, and white. A nut bowl shape is known in green. A nut bowl shape? 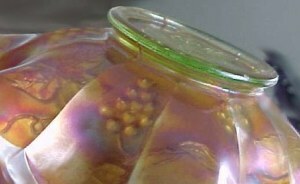 That refers to sides angled upward without ruffling. Reverse of the 9 in. Red displays paneling without scallop ring at the collar and having no star within the marie. 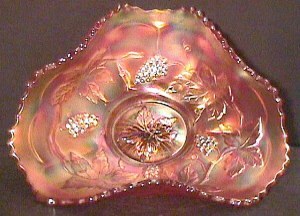 9” Red ruffled Bowl: displays use of a different interior plunger. The ends of the vine overlap and there are 5 grape clusters with seven leaves. The exterior mold is the usual paneled design with no star inside the collar base. 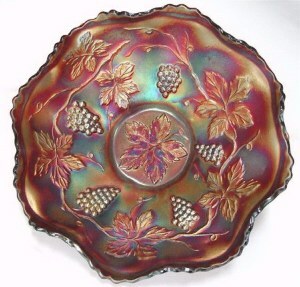 8 ¼” Celeste IC shape Bowl: This has the same plunger design as the red 9” ruffled bowl - 5 grape clusters with seven leaves. 7 in. Aqua Opal Fenton VINTAGE This sports the 5 grape clusters. 7 in. 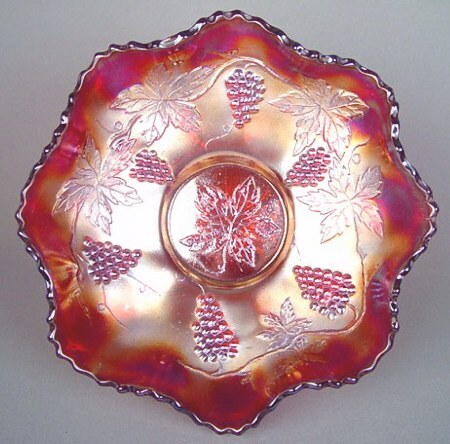 Vaseline Fenton VINTAGE Bowl with 5 clusters of grapes. 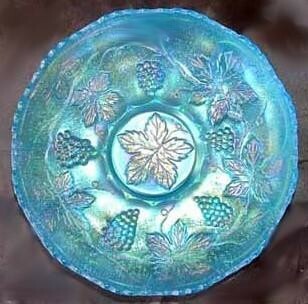 7” Aqua Opal IC shape Bowl and 7” ruffled Vaseline Bowl : Each sport 5 grape clusters and seven leaves. Exteriors are Wide Panel pattern with no design within the marie. The vaseline base bowl has a light marigold overlay, with Wide Panel Exterior and plain marie. Tri-Corner made from the 6-7 in. bowl in Fenton VINTAGE. Not often seen in Marigold. Note the 4 grape clusters. VINTAGE 6 in. Tri-Corner in Blue having the Fenton Panel Exterior. This mold having only 4 grape clusters is extermely rare. 6”-7” Blue and Marigold Tri-Corner Bowls: are whimsey shapes and each has the 4 grape clusters and six leaves in the interior design. Wide Panel is displayed on the exterior. No star within the marie. Honest expression of need (v.8).